These fun green cups are ready for a good time! They come with coordinating ribbon and gift tag and are a PERFECT little git to have on hand or take with you to a party! 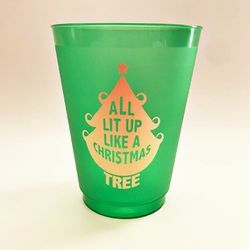 Set of four 16 oz Frosted Green Shatterproof Cups comes with coordinating ribbon tie and gift tag. Just sign your name!